This hands-on class moves beyond information and involves students in LOTS of doodling and quilting, interspersed with valuable information and hints to help you complete quality quilts and learn the “ins and outs” of free motion quilting on your sewing machine. Learn control and some great quilt designs with “Quilting Calisthentics”, a method developed by the instructor that teaches control of our hands, fabric and machine while stitching designs that have been in our memory since childhood. A great and fast way to start free motion quilting! Then move to simple loops and add in some classic motifs. Finally, take out the loops and add in flowers and leaves. By the end of the day you will have not only head knowledge but hands-on experience to go home and enjoy free motion quilting. Helpful supplies: Machine extension bed. This will eliminate immediate drag on the fabric when quilting. Instructor: motion quilting that she has developed over the past 10 years. She began her free motion adventure on her domestic sewing machine(6” throat) and progressed in a short time to completing quilts from wall hangings to king size bed quilts for both herself and professionally. She has won ribbons for her quilting and has had award winning customer quilts displayed at the local annual quilt show. Penny has been teaching free motion quilting since January 2014. NOTE: Prior to class, please make sure you are familiar with the use of your sewing machine and that it is in good working condition. It is a good idea to bring your user manual with you to class. Requirements: Required Supplies:	Sewing machine with feed dogs that drop Free motion quilting foot (aka hopping foot) � open toe works best Machine quilting needle (actual quilting or topstitch works best-80/12) Thread -	Top thread to contrast your quilt sandwich, 50 wt. works well. Thread needs to contrast from sandwich so you can see it well. -	Bobbins (two or three wound with different color than top thread, contrast top thread AND sandwich) 2-4 prepared practice quilt sandwiches (take a width of fabric piece about three-fourths yd long and sandwich it with low loft batting using either safety pins or 505 adhesive spray) Fabric needs to be a plain color - no prints, so you can see your quilting easily. Make sure your chosen thread color contrasts so your quilting is easy to see. Helpful supplies:	Machine extension bed. This will eliminate immediate drag on the fabric when quilting. Machine quilting gloves (I LOVE Machingers) or finger cots. If you don't have these, call Lickety Stitch and order ahead so we are sure to have your size. Instructor Bio: Penny Olive lives in Cheyenne, Wyoming; she has a love and passion for free motion quilting that she has developed over the past 10 years. She began her free motion adventure on her domestic sewing machine(6� throat) and progressed in a short time to completing quilts from wall hangings to king size bed quilts for both herself and professionally. She has won ribbons for her quilting and has had award winning customer quilts displayed at the local annual quilt show. 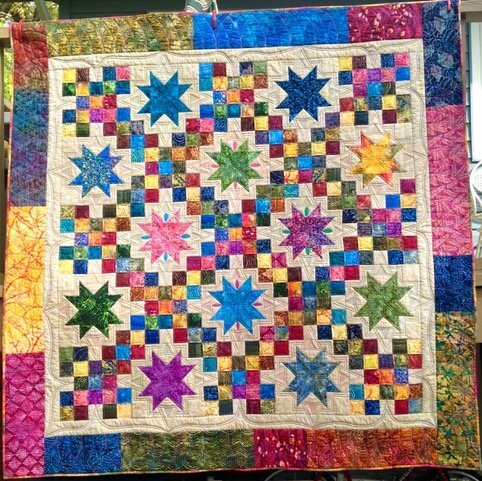 Penny has been teaching free motion quilting since January 2014.